We would wear this ensemble in a heartbeat! A camel cape coat with a black and white striped shirt and crisp black trousers finished with a classic logo Louis Vuitton and whiskey brown loafers... the entire look is perfection from head to toe! I agree! So Parisian chic to me...love it! Thanks so much for featuring my dear! and your blog is becoming one of my favourites, so inspiring! i love love this ensemble. 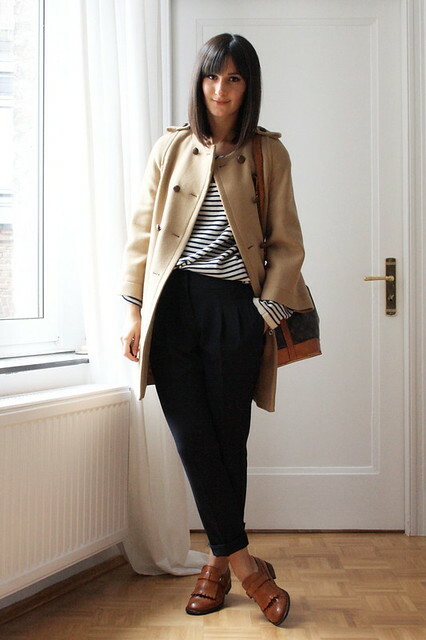 Great classic outfit,I love the camel coat! If I wore an outfit similar to this, there's no way I'd look this good. Thanks so much for sharing! Such a nice and a great post. Keep it up. Nice look you should also try topcoat.